The Chromecast has made its way to Brazil, bringing with it the ability to stream YouTube, Netflix, Play Movies, Rdio, and others. Sure, not all of the Chromecast compatible apps are able to make the leap - there's no Hulu, Pandora, or HBO Go - but that's to be expected. This is still the same device we've been following for nearly a year now, and it's gaining support from new apps by the day. Unfortunately, at R$199 (roughly $90 USD), Google's little dongle is nowhere near as affordable as it is elsewhere in the world. Then again, that's a story Brazilians have had plenty of time to get used to when it comes to tech imports. 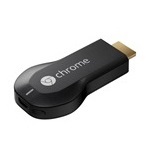 Hit up the links below to see which stores are carrying the Chromecast and the list of supported apps.